In a town like Twin Peaks, it’s not hard to get lost. Here are all the Twin Peaks maps I’ve collected so far, but please let me know in the comments if you come across any other ones! You can find three maps in Twin Peaks: An Access Guide to the Town (Amazon), a wonderful little publication from back in 1991. When I was packing for my first trip to the filming locations in Washington state, my girlfriend took the guide from our book shelf and —completely unaware all of its content is fictional— handed it over to me so I would be able to find my way around. I love her so much! The first map in the book shows the location of our favorite lumber town within the Pacific Northwest. It’s close to the Canadian border, of course, but the actual filming locations are less than an hour east of Seattle, or about 30 miles instead of the said 256. What’s interesting about the second map in the guide is that it clearly points to Glastonberry Grove. I guess that’s for all the recent tourists wishing to enter the Black Lodge? 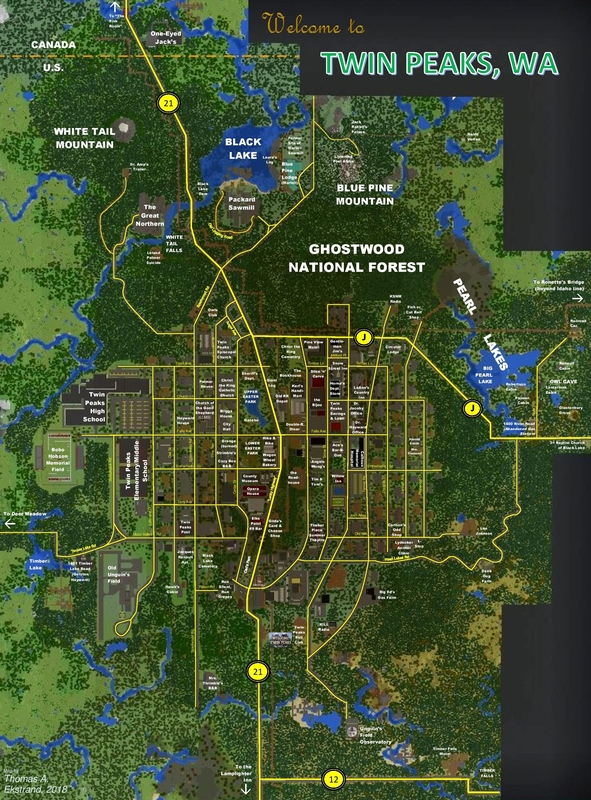 The city roadmap shows almost all the important sites, including The Great Northern Hotel, White Tail Falls, Black Lake Dam, Twin Peaks Town Hall, The Grange (burned), Palmer House, Briggs House, Hayward House, Twin Peaks High School, Black Lake Cemetery, Twin Peaks Sheriff’s Department, Upper Twin Park, The Gazebo, Lower Twin Park, County Museum, The Bookhouse, Old Railroad Depot, Double R Diner, Roadhouse, Horne’s Department Store, Calhoun Memorial Hospital, to Packard Place, to Packard Sawmill, to Owl Cave, to the Railroad Cemetery, to Ghostwood National Forest, Harold Smith’s Apartment, Dead Dog Farm, Big Ed’s Gas Station, to Unguin’s Field Observatory (U.F.O. ), and Old Unguin’s Field. David Lynch’s map to Twin Peaks introduces some new names like White Tail mountain and Blue Pine mountain (the Peaks have names, ladies and gentlemen! ), Sparkwood mountain, Meadow Lark Hill, and The Flatts. It also shows us the location of Pearl Lakes, where little Leland Palmer met a man called Robertson. And Lucky Highway 21. Adding his own place markers to David Lynch’s original sketch, Charles Ramsey of intwinpeaks.com shows us where he imagines everything is located. A very important Twin Peaks-related map —as discovered in the last episode by the ever-clever Deputy Andy Brennan— is this petroglyph exposed by Windom Earle in the Owl Cave. Special Agent Dale Cooper learns that by superimposing it on the map of Twin Peaks, it shows the entrance to the Black Lodge. There’s a print of the Owl Cave map available here. 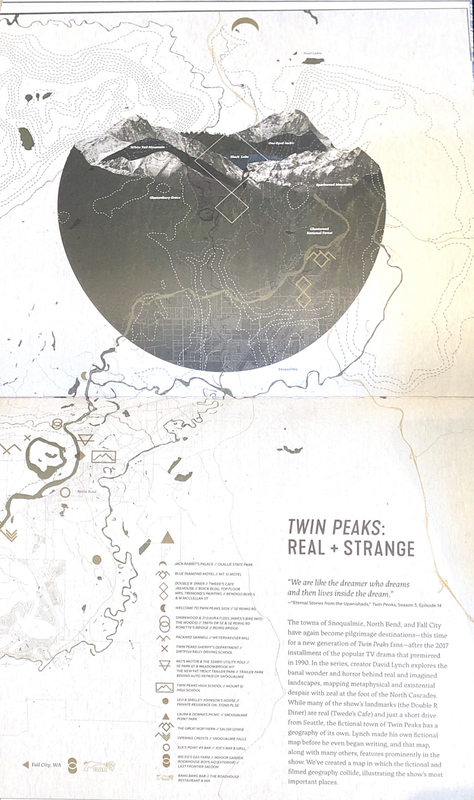 A Japanese board game called The Game Of Twin Peaks comes with this map-based game board, which is clearly a combination of two of the “Access Guide” maps above. When fiction meets reality. Twede’s, the restaurant that served as Norma’s Double R Diner in the pilot, is selling its own map to the surrounding filming locations in North Bend and Snoqualmie. Here’s a picture of that one. Here’s another map to the film sites, quite possible courtesy of the old Alpine Blossom & Gift Shoppe in North Bend that used to sell Twin Peaks merchandise. 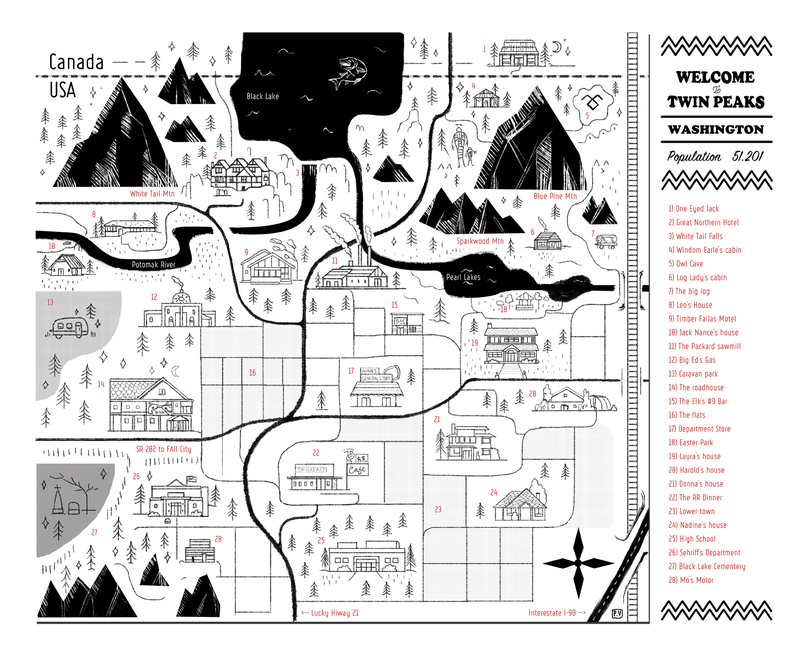 Robert Farkas‘ mom forbade him to watch Twin Peaks when he was a child, so he dedicated this map to her. I’m loving the little gazebo and the Timber Falls Motel! You can buy a print here. This is the map created for the studio-sponsored Twin Peaks: Fire Walk With Me premiere event held in North Bend in August 1992. One of the most recent maps highlights all the must see spots in the fictional town and was created by M. Walton Keys for his sister’s 23rd birthday. UPDATE (March 28 2013): A black and white map drawn by Helen aka Urban Dilettante. Also available as a t-shirt. UPDATE #2 (May 30, 2013): A work-in-progress by Petar Genov. UPDATE #3 (November 26, 2014): Jacquelin Schaab drew the map below. It’s also available as a print. The one still missing map (for 20 last years) is the one from Twin Peaks Conference Room’s board (in many episodes)! Let’s hunt that one down! Wonderful! I love them all! Now that’s what I call a damn file collection of TP maps. Thanks for sharing. Hi, I’m an illustrator and I did a map too! Love this one. Sort of looks like a board game!